The boy in this tale is not to be confused with the other one, the one who lied to gain attention. From the beginning this boy sees what really is the case, that there is a Wolf. It is ravenous, deadly, and means to devour us. He sees it in the distance, darting out from behind a hillside, swiftly disappearing again behind a grove of trees. At nearly every sighting, it has moved closer. Most do not see the Wolf. The boy does. Why? Well, he bothers to look, and, he owns a pair of binoculars. What is it that makes these binoculars work? There is debate about that. Some say Common Sense, others Fear Susceptibility, others Conservatism. There are a couple of problems, however. First, the pair of binoculars are not what we would call a precision instrument; used carelessly, it produces such a striking illusion of a far object being near that it can jar the viewer. So the boy cannot help, he says, crying WOLF! when he sees its image. Second, the boy is a somewhat jumpy fellow—he loves drama. He would never outright lie, like that boy in the classic tale. But he is not one to question a first impression, or to play-down an emotion. There is reason to suspect that his responses to seeing the Wolf are not purely involuntary. The result, of course, is that a majority of the others regard his warnings with contempt. And increasingly, with alarm—for due to his calls, there have been guns loaded, brandished, and at times even fired, apparently at nothing. More worrisomely, the boy’s emotionally infectious panic has recently convinced some folks to put together some kind of bomb-contraption (dismantling a lot of guns to do so) and lit the fuse, which they claim has the best chance of stopping the wolf. In response, there is increased talk that the boy is possessed. So that is my tale. The Wolf is Democratic Despotism, i.e., the fall of republican government. 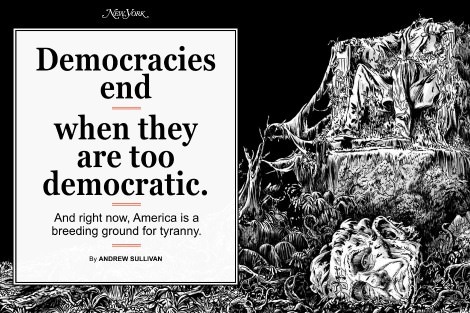 As I have said elsewhere, in America there is more likelihood than in other modern democracies that the Wolf’s arrival brings Civil Dissolution—an actual break-up of the Union–than it does submission to tyranny. What is Democratic Despotism? The main answer is found Tocqueville, but aspects of it are also sketched in book VIII of Plato’s Republic, various places in Nietzsche, Allan Bloom’s Closing of the American Mind, and in a trio of books by contemporary French thinkers: Pierre Manent’s A World without Politics, Chantal Delsol’s Icarus Fallen, and Philippe Bénéton’s Equality by Default. Present steps toward it in terms of free-speech are described in a couple of new books recently reviewed by Fred Siegel, and in terms of judicial despotism and overall governance by David Allan’s Democracy in Decline. This summer has seen the release of a particularly powerful analysis of it, by means of comparing the disturbing similarities between present-day PC “liberal-democracy” and communism. The book is The Demon in Democracy: Totalitarian Temptations in Free Socieites, by former Solidarnosc activist, and present-day politician and philosopher Ryszard Legutko. But returning to the interpretation, the boys who cry wolf are all those in our time who speak in portentous tones of the triumph of Democratic Despotism being just around the corner. For obvious but nonetheless contemptible reasons, many of these are now saying that a mere four years of Hillary Rodham Clinton being president will either be enough for it to finally arrive, or for all decent chances to defeat it to be lost. The bomb-contraption with the lit fuse is Donald Trump. (And do note, there will be much scarier bomb-contraptions in our future than this guy.) Things are so bad, our boy wonders tell us, that we might as well blow a whole lot of things up; things are so bad we must accept the risk that comes with explosion. Of course, by the logic of my parable, blowing things up in this way likely does no harm to the “Wolf” itself, it squanders powder and guns needed to be saved for the real fight, and, worst of all, because Democratic Despotism is not yet close enough for our fellow citizens to really see its danger, the present conservative toying with the Trump-bomb gives liberals plausible reasons—and when we know that their sickness of civic sense causes them to tightly clutch onto the slightest of reasons—to regard conservatism as the greatest danger of all. The persons who try to correct the boy are the rightly-informed conservatives. I.e., yours truly, and perhaps you, dear reader. It is not so important that most rightly-informed conservatives are Never Trump. It doesn’t take much, after all, to see that Trump is a dangerous bomb. Indeed, among those who recognize this simple fact are the all the Never Trumpers who remain otherwise complacent about our politics, and with some of these really being what the broad strain of Trumpist rhetoric accuses all of the Never Trumpers of being: a Corrupt Establishment. The key thing, however, that the rightly-informed conservative sees is that the danger of Democratic Despotism is a real one, and has grown substantially in the past decade. That was decent rhetoric for its time, but it will no longer do. For it looks like the Wolf really is coming, perhaps even in our lifetimes. Everything depends on our convincing our fellow citizens, a lasting majority of them, that the threat is real, and that it is not simply an imagination extrapolated out of a rhetoric that makes us feel good n’ righteous, or that merely serves to reelect a GOP politician in some district or other. Only a rhetoric of precision that points to imminent practical consequences is going to convince the needed majority. And our need for knowledge about the nature of Democratic Despotism, as opposed to merely the crude realization that the danger is real, is a pressing one. How does this Wolf come? What does it feed on? How has it been fought in the past? When the fight against it has failed, what has characterized the failure? When it has succeeded, what has characterized its success? What lessons from the past about the Wolf’s approach apply to our situation, and which ones cannot? How accurately can we hope to estimate its distance? What signs of its approach can we expect our fellow citizens who are not conservatives to see and to take seriously? How do we speak of various partial destructions of the constitutional fabric with adequate urgency, but without the hyperbole that drives people into fatalism on one hand, or into a politics of desperation on the other? And there are more horrible questions yet, that we are obliged to explore: Is there a way to survive a Wolf-mauling? To escape its destruction alive, i.e., to escape in a way that gives one’s people, or a remnant of them, or perhaps merely a new people altogether, a solid likelihood of starting republican government anew? Can liberal learning survive the Wolf? Can the Church? Compare and contrast. Back several months ago when The Journal for American Greatness still existed, one of their writers discussed the important idea of “Caesarism” as part of a response to Andrew Sullivan’s shocked realization that what he had read in Book VIII of Plato’s Republic about democracy’s fall seemed to be coming into fruition before his eyes. Caesarism is the idea, discussed by Leo Strauss among others, that a republican people can become so corrupt as to no longer be capable of republican government. They then need a kind of monarchy to prevent them from sliding into anarchy, tyranny, or subjection to a foreign invader. As there was justification for the replacement of the vice-ridden, corrupt, mob-led, and civil-war wracked Roman republic with a new kind of monarchy under the emperors, however messily this happened under Caesar Augustus, there is broad justification for “Caesarism” generally. In his On Tyranny, Leo Strauss aimed the classical teaching about tyranny at the 20th-century totalitarian rulers and the ideological excuses shamefully made for them by intellectuals, but because he would not disavow the possibility that some nations might need and deserve Caesarist (i.e., non-tyrannical) dictators, he also mentioned the teaching on Caesarism. Now the Journal writer said that part of the explanation for Trump was that the conservative masses were realizing that in an age of democratic collapse, it would better for them to have conservative Caesars, not progressive ones. A President Trump was thus to be, in some totally unspecified sense, their Caesar. The gaps in that JAG argument, which purported to be so much more erudite than Sullivan’s general Plato-based worrying, were pretty stunning. No sustained assessment that the people of the U.S. really had become unfit for republican government. No effort to show that Trump would govern in the spirit of a fair monarch or an Augustus-like emperor. No real facing up to the seriousness of even suggesting that he should partially do so in our republican and constitutional system, nor any explanation of how such partial-Caesarism would work. No chips put on the table regarding what circumstances would justify a real consideration of the Caesarist option in modern America, and how soon they might be likely to come about. For a more charitable recollection and interpretation of that now [deservedly] lost blog-column—see here. That sort of talk and loose speculation is precisely what we do not need in these times. Let us be wary of feeding fear/drama-besotted “conservatism” with such wild play with ideas. Our citizens need the practical side of political philosophy to step forward, to be able to speak to them the hard truth that yes, their democracy really could collapse in their lifetimes, could morph into a despotic monstrosity, but then to soberly lay out what the options are. We need a way of talking about and preparing for the worst without at the same time making it more likely to occur. The Trump fiasco shows us what happens when the fears and drama-talk get out of control. Here was an election the GOP easily could have won. One that might have forced the serious self-reckoning among the Democrats that our nation so desperately needs them to undergo. And here is a stain on the conservative reputation and a division sown in the Republican Party’s ranks that will together weaken conservative prospects for many years, if not decades. That is the case even if Trump somehow wins—in fact, even more so. Our tough-talking “boy-prophets” have done serious harm. I warm to them because they see the Wolf, but I despair of them for making its arrival more likely. Center-right Americans strike me today as people who are seeing for the very first time that internally developed Democratic Despotism could really Happen Here. In a way, they are seeing what has always been there. Democracy has always been a great risk. John Adams of all people tried to tell our ancestors, but generally, since the fading away of the Federalist Party, Americans have not heard it and not known it. For centuries they have been taught that nothing is so natural as republican government, rule of law, and natural rights. Now that they see these being grievously wounded, and being placed in peril of greater damage yet, they rush back to the horrible tales of tyrants told them when young, or to the standard alarmist rhetorical patterns politicians humored them with when everyone was still blithely optimistic at bottom. Finally seeing that doom is really possible, they suddenly swing back to the other extreme, back into the hoariest fears of childhood fantasy or popular melodrama, and say, say, say—for who can believe it in their bones?—that doom is right around the corner, unless a Hero-Avenger is elected. And so the Trump fiasco. I guess that’s smart for short-term professional purposes. But in playing down our alarmist side, we’ve left the alarms to be sounded, callously and most prematurely, by the “boys.” And all the while, the Wolf who will destroy every profession and lord it over our students’ students and children’s children, moves closer. P.S. The above is not saying that Trump is what Sullivan’s subtitle suggests he might be, nor that he is a fascist, nor that he is even like a Caesar. While his example might pave the way for fascistic demagogues–including those of “liberal fascist” leanings–in our future, he himself is not such, but simply a disaster for conservatism and a pretty bad sign for democracy generally. If you want a late-republican Roman analogy to Trump, Milo, the organizer of “pro-constitution” mobs to combat Clodius’s anti-constitutional ones, might make a kind of metaphorical sense. But in strict comparison, our republic has not yet arrived to anything like that point–not yet.